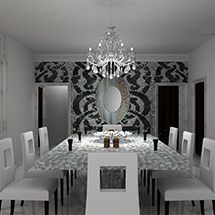 De Panache stands to the paradigm of international standards and this project is a perfect illustration of our claims. This 6500 sq feet duplex is ecstatically designed for an NRI who wanted to get serenity through our master crafted architecture. As you can see, the entrance foyer is clad with stacking stones intricately housing a functional console which hides the key holder behind its mirror. 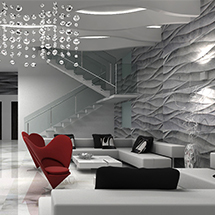 We have portrayed our excellence in perception by placing a life size mirror in such a position which perfectly reflects the the whole double height living room's stone cladding walls. It creates a mirage of the whole living room and will surely leave a deep impression on anyone visiting this house. 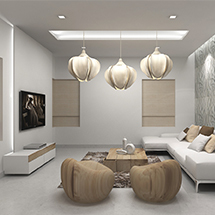 When it comes to designing the living room as per international standards, we have involved our best home automation engineers to automate the curtains and lights. This double height living room gets its final touch of grandeur with a layered chandelier. This property houses a kitchen with an attached breakfast counter having Hazel/Blum fixtures and the drawers of the under counter storages all have soft closing fixtures signifying our taste of modern living. Now coming to one of our favourites..the bedrooms! 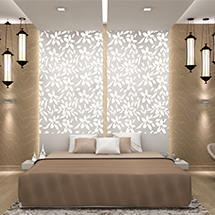 Master bedroom has been designed with a splash of beige and white while the guest bedroom has been given a touch of beige and dark wood both promising to suit your swifts of mind. 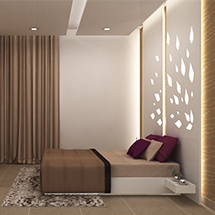 Accent walls are cladding with vinyl based wall coverings which adds to the subtleness of the room. Walk in wardrobes are included in the rooms which are loaded with all latest accessories catering to all our daily needs. The family room has been doubled up with the media centre as per individual need. Is there any better way to relax in your house than grooving up to your favourite jam or watching a game with your friends over a quart of champagne in the family room? Well you see...our designs value your life more than thing else!